Tower captain John Rigby, and his wife Linda receiving long service medals for bell ringing and singing in the choir. 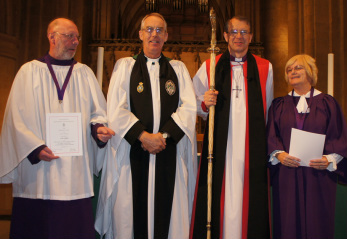 The medals were presented by the Dean and Bishop of Southwell Minister. There are eight bells in the tower and a strong band of willing ringers. John for many years has taught this ancient art, contact him for further details, all newcomers welcome. Tower and spire at the north west end of the church containing a ring of 8 bells. 1902 5th, 6th, 7th and Tenor recast. 1961 5th, 6th and 7th were rehung and 3rd and 4th added. 1973 The treble and 2nd added. 1991 New metal frame installed and all the bells fitted on one level. Who Rings at All Hallows? Bell ringing can be started at any age, from about 10 years old, and people ring all their lives. From when you are strong enough, to when you are no longer strong enough! So age is no barrier! The art or study of bell casting and ringing. Bellringing is an English pastime and originated in the British Isles. Over the last two centuries bellringing has carried worldwide and now there are towers in Australia, Canada, South Africa and the U.S.A. to name a few countries in the world which now have bells rung the English way. The English way is that the bell is rung 360 degrees in a full circle. The bell is fitted with a wheel to which a rope is attached and a clapper is fitted inside the bell to make the sound when the bell is rung. The safe position is when the bell is hung with the lip of the bell downwards. The ringing position is when the bell is turned 180 degrees and the lip if the bell is upside down. When the bell is in this position the rope is pulled by the ringer below in the belfry and the bell is turned from handstroke and then to backstroke and then returned to handstroke. The basic pattern of ringing is called rounds. 1 being the treble bell which is the lightest bell. 6 being the tenor bell the heaviest bell. Why Do We Ring Bells? To ring for Sunday services to let the people of Gedling know that God and the church is alive and welcomes all within the building. We ring for weddings, to let everyone know someone is getting married, and to finish the service off with a happy sound. We ring for funerals, as a last respect for people who have been regular church members. We ring for special occasions. The bells were rung at the end of the war, and when kings and queens are crowned. We also ring in the New Year. We support the local ringers from other towers within the Southwell and Nottingham Diocesan Guild. We share many social events together. Ringing is a good social pastime which brings young and old together to have good friendships and fun within the band of ringers.